Webinars, webcasts, online events – most of us have either hosted or participated with varied success. And as an attendee you’ve either been bored to tears or find these events invaluable. No matter your experience, they are hardly consistent from event to event, but why? + Webcasting: What is it? What are the various uses? How to properly prepare for your audience & what to look for in a service provider. 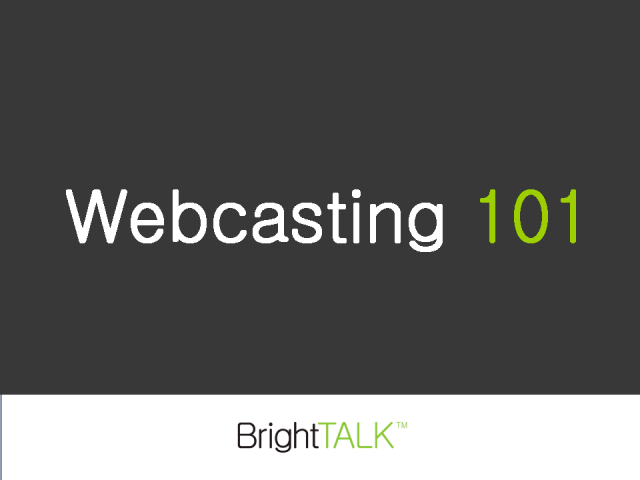 Join BrightTALK's Webcast Evangelist, David Pitta, as he outlines techniques from 10 years of webcasting experience into a simple strategy that will produce an invaluable audience experience every time. David has used webcasts to inspire, inform, and persuade small to large groups since 1999. He is responsible for the webcast strategy used today at: Monster.com, California Pizza Kitchen, NYU Law & Business School, USC Distance Education Network, DoubleClick, and numerous Law Firms, Financial Services, and Technology companies. His methodology focuses on developing the right content for the right audience and delivering visuals that engage and promote interactivity with your audience.